Developer Andreas Hausladen has released a new version of his legendary IDE Fix Pack utility for Delphi XE8. The IDE Fix Pack greatly speeds up the loading time of the IDE, reduces compile times, and seems to fix some of the problems you may encounter when using the Delphi IDE. I’ve used the IDE Fix Pack in XE5, XE6, XE7, and now XE8 for all of my Android, IOS, Windows, and OSX projects; don’t leave home without it. Delphi is all about development speed and this third party enhancement really delivers on helping you get your project done faster and with less IDE issues. One big difference with this new XE8 version is it greatly enhances the loading time of the Castalia add on. It also has some bonuses for CodeInsight and TStringList.IndexOfName. The changes that the IDE Fix Pack makes are made in memory and not on disk. Plus no changes are made to your actual project files. I am not sure if it works with Appmethod (try it and post a comment?). You can read about the changes in this version on the blog post here and here. 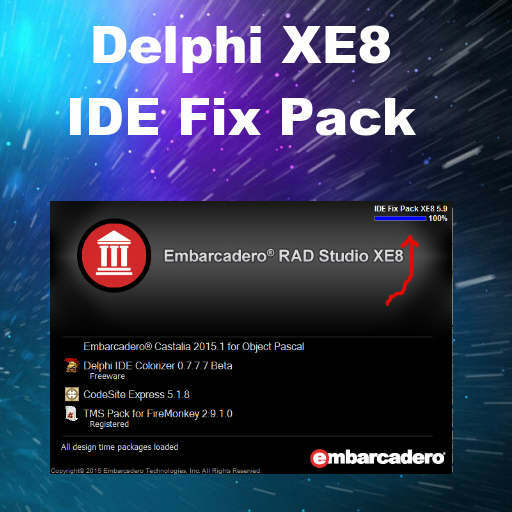 Download the IDE Fix Pack for Delphi XE8 Firemonkey and speed up your IDE right now for free.